An Interview with Gary Hymel. · One Book. One Author. One Hour. 1:34 – I understand you have a special relationship with C-SPAN and Brian Lamb. Would you like to tell us about that? – Brian Lamb came to Hymel and Speaker of the House Tip O’Neil to discuss making the House television feed publically available. This was the coverage that started C-SPAN. Later Hymel appeared regularly on C-SPAN. He discusses the process of writing this book with Tip O’Neil. The book was a collection of stories and anecdotes from the Speaker. Originally, O’Neil was supposed to appear on Booknotes, but unfortunately he passed away shortly before the show and Hymel appeared in his place. 4:43 – How did you prepare for your appearance on Booknotes? – He worked with Speaker O’Neil for 16 years and had heard these stories many times. O’Neil felt that many of his stories had been coopted by others and wanted to take them back. Because Hymel knew these stories so well and had written a book on them he did not do much preparation. 6:11 – What do you remember most from your appearance on the program? – Brian Lamb putting you at ease. He made it easy by creating a conversational tone. The hour went by very quickly because of this. Hymel thinks that putting the interviewer at ease was Lamb’s true talent. 7:08 – What are the benefits or drawbacks of the longer format interview for the author and the viewer? – Having watched Booknotes Hymel feels that it allows authors to go into so much more detail and explanation than other interviews. The value of the length of the program is that it gives the author free range and its possible to understand more nuances through an in-depth conversation. 8:25 – Was Lamb’s preparation normal for interviewers and how did it change your interview experience? – Because Lamb thoroughly read the books and had an hour to interview an author on the subject, they were able to get in-depth. Hymel thinks that most other interviewers do not even read the entire book being discussed. 9:47 – Do you think the reading public finds the details about the practice of writing interesting? – Most probably do not, but people who are avid readers of books probably do care. Hymel himself loves to read biographies and so he is very interested in hearing about the practice of writing. Authors particularly would be interested in these details. 10:54 – Were you surprised you were asked biographical questions? – No because he had watched Lamb and Booknotes before his own interview so he knew to expect these kinds of questions. But other interviewers do not ask biographical questions. 11:33 – Were you surprised by any of Brian Lamb’s questions? – No. 11:47 – Did your experience with the program change your impression of it? – No because he knew and respected Lamb’s methods and how he wanted to get into so much detail. Lamb’s skill was to get into so many details in such a conversational way. 12:39 – What do you think the benefits and uses of the Booknotes Collection might be? – He is not sure. But as the reading of print books is shrinking in the digital age he thinks having these books is a great resource. 13:33 – If asked back would you have returned for another interview? – Sure, because it was a pleasure being on the program. Hymel isn’t sure why he has this rule. 13:51 – Was there a difference in sales or national attention after appearing on Booknotes? – Hymel does not think so. He believes that O’Neil’s fame and recent passing at the time of publishing carried sales. 14:17 – Did your experience with the show cause you to rethink any of your own assumptions regarding your research and writing? – No but he did learn the lesson that if he was ever interviewing anyone to try to put them at ease. 14:44 – What have you been working on since this book and what works are you most pleased with? – Hymel is retired now and is an avid reader. 15:16 – In your estimation what has been the lasting impact of Booknotes? – It showed people that if you want to get into the depth of a book then you should watch Booknotes. Lamb drew thoughtful details from books and authors. 15:56 – Is there anything else you would like to add? – No. Lindsey Bestebreurtje (Oral Historian), “An Interview with Gary Hymel.,” One Book. One Author. One Hour., accessed April 24, 2019, http://booknotes.gmu.edu/items/show/2783. 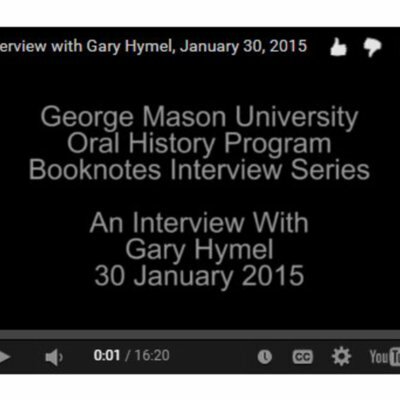 Gary Hymel is interviewed as part of the Booknotes Oral History Project on 30 January 2015. Mr. Hymel discusses his appearance on C-SPAN's Booknotes program on 23 January 1994, where discussed his book "All Politics is Local and other Rules of the Game". Booknotes Oral History Series. R0143 Box 02 File 09.